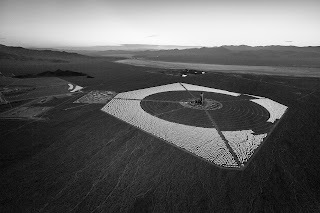 photo-eye Gallery is very excited to announce a new body of work by represented photographer Jamey Stillings: Ivanpah Solar. Ivanpah Solar Electric Generating System, is a massive, nearly 400 Megawatt, solar thermal electric generation system designed to power over 140,000 homes across Southern California. From its ground breaking in 2009, the project has created quite a footprint in the southwestern desert. 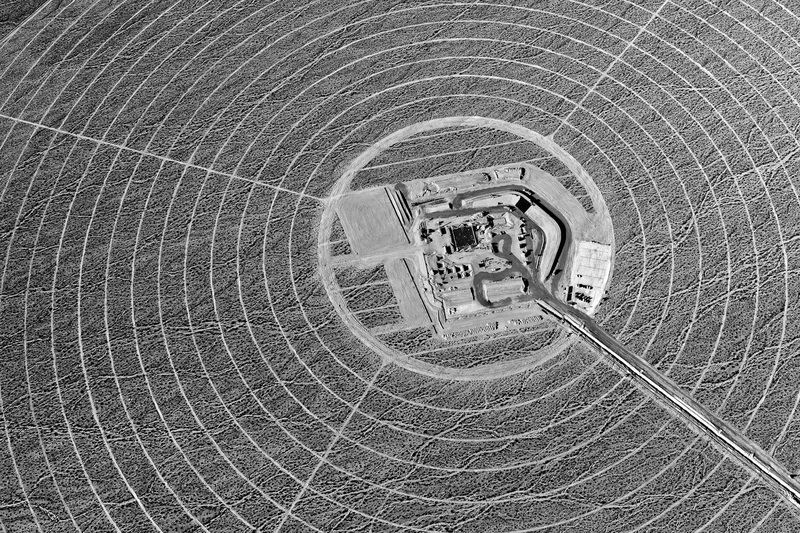 Photographed from the air deep in the Mojave Desert of California, Stillings' photographs of the Ivanpah Solar Electric Generating System draw in sharp relief the organic patterns of nature and how we as humankind mark and mar the landscape. To coincide with the release, photo-eye asked Stillings to tell us a little bit more about this massive undertaking. "I have always been fascinated by the visual energy and tension produced at the intersections of nature and human activity. Uniquely as a species, and on a global scale, we consciously modify and use the environment for our perceived needs or enjoyment. Sometimes we consider the consequences of our actions. 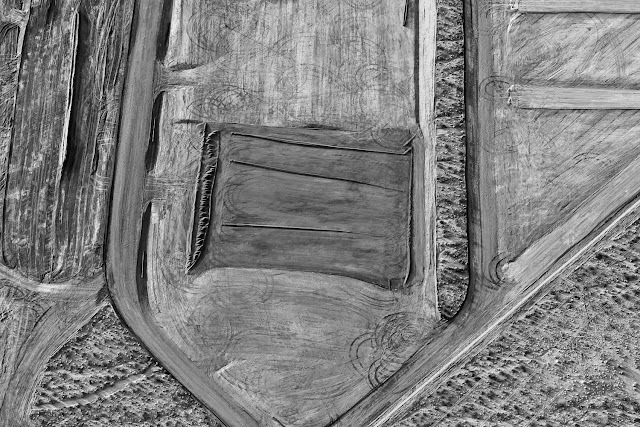 Frequently, we focus myopically on the short-term utility of land and resource use. "I believe that creation of renewable energy projects, on both micro and macro levels, is essential to our civilization's long-term survival. It has been interesting to learn that the issues surrounding large-scale renewable energy projects are as complex as any other type of power or resource development. A multitude of environmental, economic, political and social choices need to be worked out, often by people and organizations that are theoretically on the "same" side. "With this in mind, I enter the air in a small helicopter, camera mounted firmly to a gyroscope. On one level, I am observing intently, consciously and subconsciously, the interplay of natural and manmade forms as the Ivanpah Solar Electric Generating System (Ivanpah Solar) takes shape in the Mojave Desert. The dance is magical. Vein-like gullies move down a huge alluvial fan to reveal the periodic erosion of desert storms. In counterpoint, laser-sighted fence lines, geometric berms formed by large earthmovers, and thousands of heliostats (mirrors) organize the landscape for a chance to harness the sun's energy and create electricity for a few decades. "One part creative indulgence, one part practical observation! The interplay of forms provides its own seduction. Enough that I might be content to operate solely on this level! However, my practical side wants to share this transformation to stimulate a broader conversation. If we can comprehend just what creation of large-scale renewable energy projects entail, we can better evaluate and discuss the often-difficult choices and compromises necessary to see it become reality. 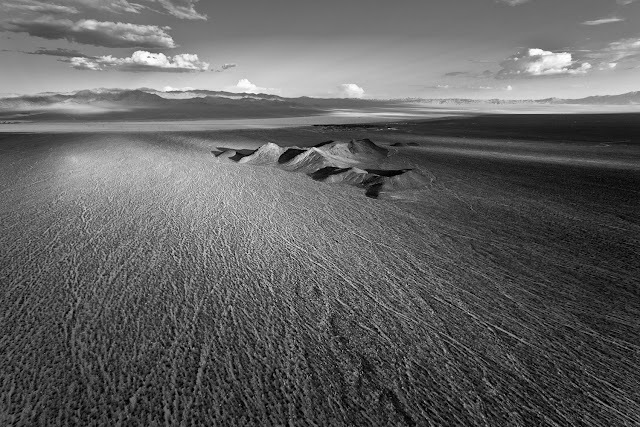 The Ivanpah Solar series will be on exhibit at photo-eye Gallery from the end of September through the end of November. To view additional images from Stillings' Ivanpah Solar series please visit the Ivanpah Solar portfolio on the photo-eye website. To view Stilling's most recent body of work The Bridge at Hoover Dam please click here. 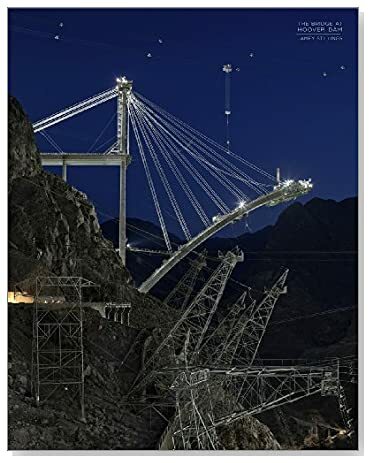 Signed copies of both the trade and limited editions of The Bridge at Hoover Dam from Nazraeli Press are available through photo-eye Books. For additional information about Jamey Stillings or to acquire one of his photographs, please contact the gallery at (505) 988-5152 x202 or by email.